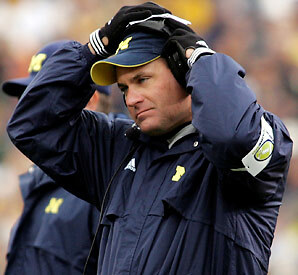 Michigan lost 30-28 on Saturday to Iowa. The Wolverines should be proud of their effort. Iowa was artificially ranked #12 so winning would have been “an upset.” Conversely, Michigan outplayed Iowa and should be horrified that five turnovers and atrocious third-down conversions wasted that effort. As with everything this Michigan season, there are two ways of viewing it. Utah’s untarnished and unrewarded season has aroused sympathy from the BCS. Subsequent small conference juggernauts will not get equal determination of the title on the field (because that would be silly), but they will receive a hypothetical olive branch, the Rose Bowl. The Big Lead » Blog Archive » Sam Keller Wants to Piss On Your Video Game Parade. Conventional Wisdom Scoffs at NFL in London. Why? Thoughts on 30 for 30: Small Potatoes, Who Killed the USFL? Tyler Duffy Create a free website or blog at WordPress.com.